With the summer concert season coming to a close, a few tours were still headed down to the Lone Star State. The Rock Allegiance Tour hit Grand Prairie and Houston, Tx this past week it continued its twenty four city tour of North America. And though ticket sales have been a bit lower than most would have liked, that didn’t stop the bands from putting on a killer show or the fans that were there from showing their love. The bands had had a nice day off before the show and everyone seemed well rested. 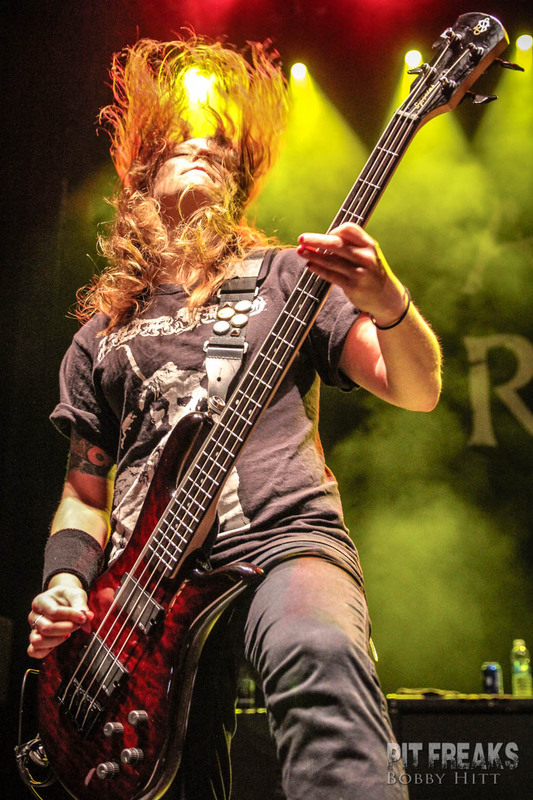 Australian band Airbourne, sadly, had to drop off the tour due to a family emergency, which meant a slightly longer set time for the only American band on the tour, All That Remains. Hailing from Massachusetts, the band is on tour supporting their 2012 album A War You Cannot Win. Arguably the hardest sounding band of the three, All That Remains struggled a bit to get the crowd going in Grand Prairie. Playing earlier than they would have if Airbourne was still on the tour seemed to be a little daunting. The Grand Prairie crowd was still showing up and the relatively small pit wasn’t all that energetic yet. Never the less, All That Remains gave it their all and the fans that were there began to get into the spirit. In Houston, however, the crowd seemed more awake and into things right from the start and it was clear the energy from the crowd boosted the energy of the band. Though the overall crowd size for the entire night was smaller in Houston, more had arrived in Houston by the time All That Remains started. Next up was co-headliners, HIM. The band, hailing from Helsinki, Finland, hadn’t been in North America since 2010 and it was more than obvious that a huge majority of the fans at the show were there for them and insanely excited to see them again. Originally listed as having an autograph signing session the night of the Grand Prairie show, many fans were disappointed to find it canceled at the last minute. Some had traveled great distances specifically for the signing – from as far north as Maine and as far south as Mexico. While there was never any solid explanation given, the fans didn’t let it stop them from having a wonderful time and letting the guys from HIM know how much they’d been missed. In support of their latest album, Tears on Tape, HIM played a nice mix of old and new songs – four of the fifteen song set list where from the new album and a few of the older songs hadn’t been played live in a while. 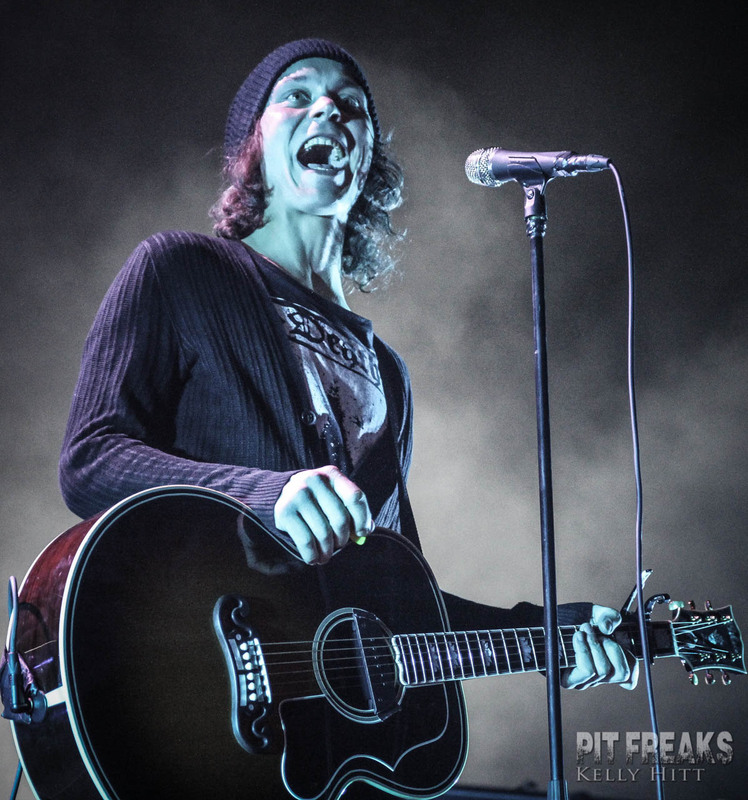 And for the first time in as long as many could remember, vocalist Ville Valo brought out his acoustic guitar for several songs in the set. This band is a special one for me. It’s the band that got me started in my music journalism and photography and for that reason I tend to always enjoy myself at their shows, even if things are a bit off. With that being said I can honestly say I have never heard them as on point and as tight as they were this night. Every member was giving 110% and obviously having a grand time. Of course the love pouring from the crowd certainly helped and Valo was all smiles. Having spoken with the crew and fans that have been to other shows, HIM is definitely at the top of their game this tour and more consistent than they’ve been in a long while. Houston was much the same. Though the crowd was a bit smaller, the excitement that the band had finally returned was still there and the signs and homemade gifts held up put a huge smile on Valo’s face. He seemed especially excited when he spotted a guy in the crowd wearing a shirt from Valo’s dad’s shop in Helsinki, Aikuisten lelukauppa (which translates to Adult Toy Store). That a shirt from a little shop in Helsinki showed up in Texas after all these years seemed to make him incredibly happy. Rounding out the night was the other co-headlining band, Volbeat. Also from Scandinavia, this time Denmark, Volbeat is a different sort of animal. People tend to love them or hate them and the crowd in Grand Prairie clearly loved them. Their sound is something I can only describe as Scandinavian Rockabilly – clear Rockabilly vocals but with the darker, harder, and slightly more melancholy sound you get from Scandinavian bands. Still, Volbeat has gained a strong following and their fans are growing every day with all the airplay they’ve been getting on the radio. 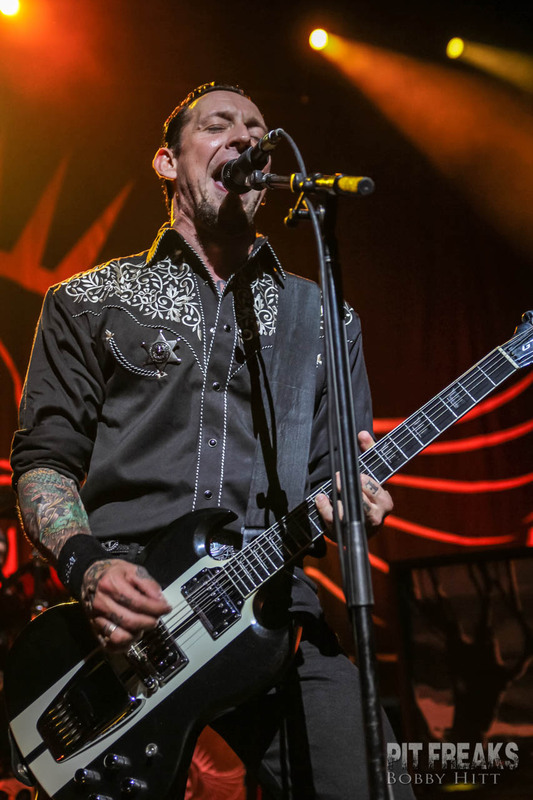 Vocalist Michael Poulsen jokingly called the band ‘Anthrax with three new members’ – ex Anthrax guitarist Rob Caggiano is a member of the band – and that got a nice laugh from the crowd. Supporting their current album, Outlaw Gentlemen & Shady Ladies, the band played a nice mix of songs and even threw in a few things for fun, like a bit of “Ring of Fire” by Johnny Cash – a big influence on the band. With a bit of moshing and crowd surfing from the crowd the band was in great spirits and despite the show being in the middle of the week the pit seemed pretty full. Again the Houston show was very similar and the smaller crowd didn’t stop it from being a great night. If anything it was a slightly more intimate show and everyone had a great time. If you have a chance to catch this tour I definitely recommend it. You’ll get a nice mix of music and bands all having a great time. Be sure to check out their music, all of which can be found on iTunes or at a local retailer near you.